Do we have your permission to send you updates from NightShift? We require parental/guardian permission for minors to come to NightShift. Do you have permission to attend alone or with an adult? Are you contacting us on behalf of a group or organization? Name of your group or organization? Age category of your group? How often would your group be involved? What time are you thinking of helping out? We'd like to get to know you - can you provide us with some more details? If we invite you to attend a volunteer orientation, which date works best for you? Which of our programs are you most interested in? How did you hear about NightShift? Name of person or organization that referred you? Introduce us to your group! Is your group looking for a local cause to get involved? Does your organization or business encourage groups to be hands on for good in the community? Is your youth group doing a food or coat drive? Are you looking for an opportunity to engage on the front lines of our streets? We welcome adult and youth groups who want to become involved on a regular basis with NightShift or are looking for a one-off visit to Whalley in Surrey, BC. Tell us a little about your group and we will help you fit right in. Let us know when your group is thinking of dropping by for a one-time visit. We’ll arrange for a short introduction, any visitor requirements and plug you in – whether you’re interested in supporting evening outreach or helping out during the day. Perhaps your group is interested in participating on a regular basis? In this case we’ll make arrangements for you to come alongside an existing team initially and maybe – when the time is right – you may want to take on an evening of your own! We encourage each person to attend our volunteer training program. Individuals may register online for one of our monthly Welcome Nights to find out more, sign up for our in-depth FORGE series, or we can book a special group training session if you have at least 15 participants in your group. Please contact our Volunteer Services team with any questions you may have. Monday-Friday, during office hours, help organize in the warehouse (e.g. sorting supplies, preparing care kits), or help our admin team (e.g. library support, inventory of program supplies), or go on clean-up duty (e.g. sweeping and washing floors, cleaning bathrooms or windows, vacuuming) in and around our centre. Support a regular food prep team on certain days for 2-3 hours when the NightShift kitchen is being used to prepare the evening meal. Some teams use their own Fraser Health approved kitchens, so we would match you up with the appropriate group. Does your group have a particular skill or desire to provide support for one of our education or ministry programs? We run a weekly Art Class and Bible Study group, seasonal Alpha, support groups, and so much more. Let us know what you have in mind. Monday-Sunday, 6:30-8:30 pm, come alongside one of our regular outreach teams and help to serve a hot meal, hand out desserts or drinks, provide support for the clothing truck, mingle with the crowd to offer companionship, join in with the music ministry or offer prayer support. Visiting group please no more than 12 people. If your group is good at gathering supplies that would support our operations, let us know! The need to stock our food and clothing shelves is there throughout the year, not just in the winter months. Here are some of the things you might consider for a clothes, blankets, food or supplies drive. During the school year (Oct-May), 6:30-8:30 pm, we encourage small groups of young adults (approx. age 18-24) to go out into the community and engage with people in small Acts of Kindness. Many of our street friends would admit to not having a single friend. That’s why our AOK teams offer conversation and encouragement, share hot chocolate and snacks as available, and where appropriate, refer people to access the NightShift outreach and Care Bus for additional support. AOK teams tend to comprise groups of university or college-age students under the supervision of a group leader (ratio 1:4 – that is, one adult for every four youth under the age of 19). For the 2016-17 school year we already have groups committed on Mondays, Tuesdays and Thursdays. 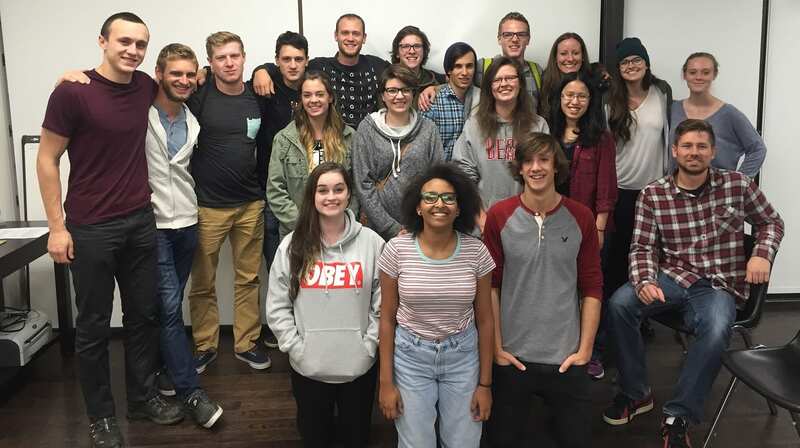 If yours is a youth group from a high school, church or other organization, we can usually accommodate two small groups under the supervision of their teacher or youth group leader at any one time (ratio 1:5 – that is, one adult for every five youth under the age of 19), in the evenings or during the daytime. Children may accompany their parents or guardians (ratio 1:2) at the discretion of their parents and as part of their parents’ volunteering role. Parents/guardians must complete Consent Forms for each child under the age of 19. This is for one-time visitors as well as for regular volunteers. There are lots of ways to get involved. Please use the form on this page or contact us if you have any questions regarding our adult or youth and young adult programs.